PiOctave Solutions provides smart security systems that let you monitor your home from anywhere across the world. It all started with an incident when Kiran Nayak’s friend was on vacation abroad and there was a burglary at his well-guarded apartment with a couple of security guards. His neighbors were not able to reach him. Nobody had his contact details as he had moved there recently. He was contacted only the next day and told about the situation. When Kiran visited the house to check on it on his friend’s behalf, he figured that the burglar had sensed there was nobody in the house and had entered through the door by breaking it. In 2014, there were 245 million professionally installed video surveillance cameras active and operational globally, according to a research by IHS Markit. And according to its Top Video Surveillance Trends for 2017, 98 million network surveillance cameras and 29 million HD CCTV cameras will be shipped globally. But this surveillance, for the most part, is only used for recording and reacting after something happens. Out of these millions of cameras, less than 5% are monitored by a human at any given time. His friend’s burglary got Kiran thinking of developing solutions where people can be connected to their homes from anywhere and at any given time. “Having rich experience in developing video conferencing products and solutions, we thought how we as a team can take our skills and experience in developing solutions that should provide the sense of the surrounding and have your virtual presence. The solutions should be easy to deploy in existing houses. Also, it should be a platform, which can allow you to connect to your neighbor when in need,” says Kiran. 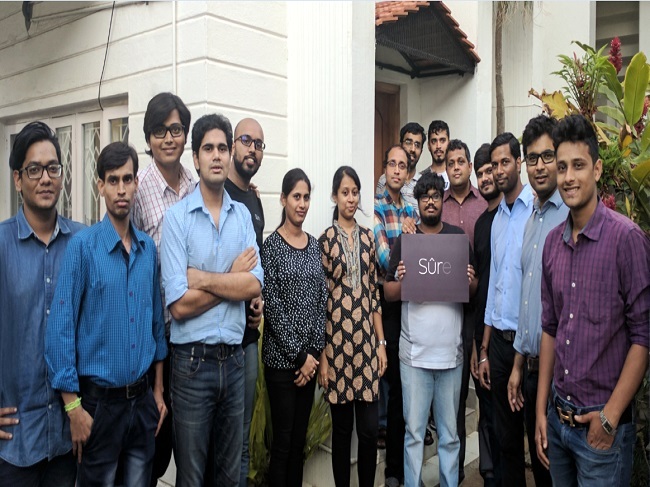 To take video surveillance and security systems one step further, Kiran Nayak, Anand Sivaram, Niteesh Kumar and Gijo Prems founded PiOctave Solutions in Bengaluru in January 2016. The core team has previously worked on video conferencing technology for Cisco. PiOctave has developed smart cameras embedded with machine learning that lets one act on the video data in real time. The idea is to reduce response time for emergency services and possibly even prevent accidents and crime before they happen. Its first product is a smart doorbell called SureBell. Kiran says that the hardware is simple enough to be categorized as a do-it-yourself solution. It replaces the doorbell switch in one’s house. The device connects to WiFi and can be integrated with any number of mobile phones through its app. There is also a camera that can be fixed and the camera gives you a 180-degree horizontal and 130-degree vertical view. So when someone rings the doorbell, it sends a notification on all the integrated mobiles from the app, anywhere in the world. You can see and hear the person from the app. It then lets you call the device and speak to the person standing in front of the door. SureBell even lets you record if there is any motion in front of the camera. There is also smart analytics that comes into play. For example, you can draw out the area that you want recorded in case of any movement or activity and want to be alerted about. “With a cloud centric approach, Sure Bell is no different from an enterprise grade video conferencing system. It is backed by a Sure Cloud engine, which includes targeted video analytics, efficient footage management, bandwidth-aware streaming and above all, Sure Cloud is Home Awareness ready. 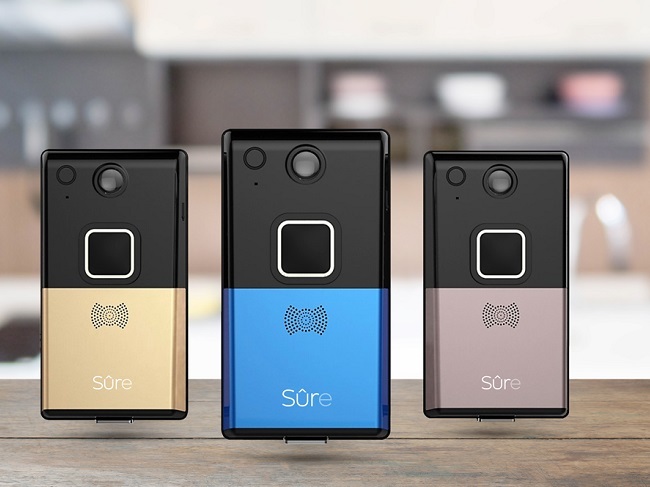 We are also in the process of designing the Sure Chime solutions which will be the central controller of the house and will be WiFi based paired devices with Sure Bell,” Kiran adds. The device has not yet been launched commercially. In the last fourteen months, PiOctave has been working on the product design to make it intelligent, intuitive and instantaneous. In the next 15 days, it will be rolling it out to its first 100 customers to test and receive feedback and improvise upon before soft-launching it on July 15. Shipments of the final product will begin in the end of July. In its first phase, it will launch its product in Bengaluru and Mumbai. The SureBell will be priced in the range of Rs 12,000-15,000. But the final cost is still being worked upon and the company is also looking at a monthly subscription model. PiOctave is also looking at a B2B2C and B2C model. Target customers will be new and existing homes, small shops and establishments and offices. In the B2B2C model, it is also looking at builders and developers who can give the device to those who buy their homes. It will have restricted cloud access and the cloud plan can be purchased through the app for unlimited connectivity. It is also looking at tying up with players in the smart door-lock space to integrate a smart lock system with SureBell. This will let users remotely open or lock the door from anywhere in the world. “We will also be looking at integrating some smart sensor like motion, gas, etc in the coming months,” adds Kiran. And once it manages to sell 10,000 units, PiOctave will also be eyeing global markets. PiOctave has raised funding with Pronovo Ventures. Pronovo Ventures is backed by individuals who have rich experience with consumer products. This has helped PiOctave with their go-to- market plan and strategy. Speaking about competition in this space, Kiran says that it is competing with video door phones and security devices like CCTV cameras. “The Video door phones or VDPs today are devices that allow interaction that is limited within the house. These devices require complicated electrical connection with cost account for rewiring. Security is limited till you are on the other side of the door. These products are only evidence gathering devices, as against SureBell, which can notify the user of the potential threat allowing him to interact and react to the situation,” he adds. PiOctave is not looking to restrict itself just to interactive security systems. In the next six months to a year, it is looking at personal emergency systems, energy management and climate control, lighting control and healthcare systems. Through the cloud offering they plan to provide a virtual intercom solution which can connect users to ensure a safer neighbourhood. In the long term, this startup wants to provide complete end-to-end solutions that customers haven’t experienced before at a very affordable cost. It will be working to bring smart sensors along with smart camera products. The idea is to build PiOctave’s ‘Sure’ as a brand synonymous with Smart Security in India and globally.